Dia de los Muertos is a Latin American holiday honoring the dead with food, drink, parties, and activities. It is a time to commemorate the dead and celebrate their lives with family and friends. Volunteers are needed to help set up, sell bread, paint faces and more! Location: Rainier Community Center, 4600 38th Ave S. After a brief welcome, buses will deliver volunteers to six restoration projects in Southeast Seattle - Genesee Park, Cheasty Greenspace, Maple Wood Playfield, the East Duwamish Greenbelt, Rainier Beach Urban Farm & Wetland, and Seward Park. Return by bus to Rainier Community Center to enjoy a delicious free lunch and hang out with your fellow volunteers. Festivities include educational and family-oriented activities all day long. The Green Seattle Partnership is collaboration between the City of Seattle, Forterra, community groups and nonprofits, businesses, schools, and thousands of volunteers working together to restore and actively maintain the City's forested parklands. Join together with hundreds of volunteers on Green Seattle Day, planting thousands of plants in parks throughout The Emerald City. Ages: All community members are welcome! Reading Buddies is an after school program for Kindergarten students at Madrona Elementary School. You and your family can volunteer to be reading partners with kindergarten students and help them improve their developing skills. Come as many weeks as you like, our staff will help you get oriented and partnered with the right student! We hope you can visit us at least once a month. This is a great project for families. Children of any grade older than Kindergarten can share what they have learned and will improve their skills in the process! Ages: Families with children in first grade or older are welcome to volunteer. The Amara Emergency Sanctuary is a temporary home for kids to stay in for up to three days immediately after they are removed from their homes by Child Protective Services or the police, and is the first emergency shelter of its kind in King County. An alternative to waiting in an office or police station, the Emergency Sanctuary is staffed with warm, welcoming staff and volunteers who are focused on caring for kids during this traumatic transition. These kids often don't know what is happening or why. Sometimes kids arrive at the Sanctuary with a few belongings in a trash bag. Often, they arrive empty-handed. You and your family can help out by holding a donation drive that will help make sure that children entering foster care through the Sanctuary have shoes, clothing, an opportunity to participate in engaging activities, and a new backpack to use for their belongings. You can organize a drive for Amara online or in-person. The choice is up to you! Each year, EarthCorps leads more than 10,000 volunteers in environmental service projects in western Washington. While the exact tasks at hand vary, EarthCorps projects focus on improving the forests and parks in our local cities. Healthy and thriving forests are vital to our community because they absorb and naturally filter rain water, absorb toxins in the air, produce clean oxygen, provide living spaces for wildlife, and they create a place for people to connect with the outdoors. In order to help create healthy forests, we focus on removing aggressive weeds (like English Ivy or Himalayan Blackberry), maintaining areas where these weeds have been removed, and planting trees and shrubs during the rainy season. EarthCorps supplies gloves, tools, water, light refreshments and volunteer education. EarthCorps will provide everything you need to know about tool use and safety, forest health, information on the park, and the importance of the work you'll be doing. No prior experience necessary, just come ready to learn something new! Ages: Family members of all ages are welcome to volunteer. Only a select few sites are not appropriate for very young volunteers and will be specified as such on the event info page. Location: Seward Park, 5902 Lake Washington Blvd S, Seattle. Enter Seward Park and follow signs past the Audubon Center (old building on the right-hand side), stay right at the fork, go up the hill, and park at the first upper parking lot near the swing set. Do not leave valuables in your car. Also accessible by Metro Bus #50 to Seward Park Ave S & S Juneau St. Follow signs to the first upper parking lot. We will meet by the restrooms past the swing set. Climate change puts 50% of North American birds at risk. Mitigate local impacts by restoring our urban forest oasis for resident and migrating birds, while building community with friends, family and neighbors. We'll be pulling out invasive species and planting native plants like Oregon grape and salal. Tools, gloves, training, snacks and coffee provided. Bring the whole family! Please dress for rain or shine in warm, dry layers that you don't mind getting dirty. Closed-toed sturdy shoes/boots, long sleeves, and long pants are a must! Bring a full water bottle and a pack lunch or snacks. Ages: Everyone can participate. If you are an unaccompanied minor (under age 18) please bring completed waivers. Please check our online volunteer calendar for availability. Weekday volunteers are Food Lifeline's greatest need! Food Lifeline is a Feeding America food bank serving Western Washington. Food Lifeline approaches hunger as a logistical problem that can be solved. By redirecting good food from local farmers, grocers and restaurants that might otherwise go to waste, Food Lifeline can provide more than 88,000 meals daily. Volunteers inspect, sort and repack these donations for distribution to our network of 275 hunger relief partners. Volunteers must wear close-toed shoes and we suggest dressing in layers as the warehouse is not climate controlled. Ages: Volunteers must be at least six years or older. Volunteers 15 and under require adult supervision. Youth groups require one adult for every five kids. Time Commitment: Shifts are typically two to three hours long. Contact: Volunteers can schedule online at www.foodlifeline.civicore.com. Or contact Heather or Ariel at 206.545.6600 for scheduling assistance. One in seven people in America are food insecure, living in households that lack the means to get enough nutritious food on a regular basis. Rice and beans are nourishing, filling, and infinitely adaptable food staples. 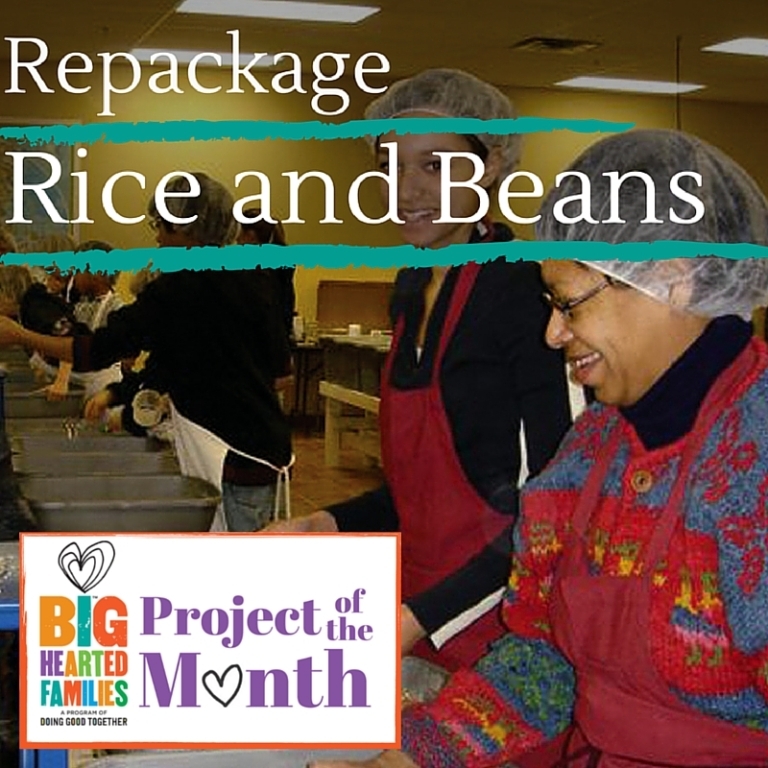 You and your family can help feed the hungry in your community by transforming inexpensive bulk-packaged goods into meal-sized portions. Check out Doing Good Together's project page for project instructions and reflection questions.